William Shakespeare: Venus and Adonis. Englisch/Deutsch. Übersetzung von Ferdinand Freiligrath. Herausgegeben von Christa Jansohn. This attractive new edition of Venus and Adonis offers two versions of Shakespeares narrative poem. 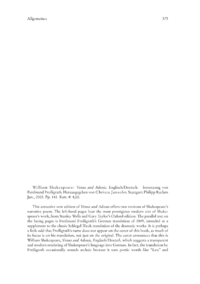 The left-hand pages bear the most prestigious modern text of Shakespeares work, from Stanley Wells and Gary Taylors Oxford edition. The parallel text on the facing pages is Ferdinand Freiligraths German translation of 1849, intended as a supplement to the classic Schlegel-Tieck translation of the dramatic works. It is perhaps a little odd that Freiligraths name does not appear on the cover of this book, as much of its focus is on his translation, not just on the original. The cover announces that this is William Shakespeare, Venus and Adonis, Englisch/Deutsch, which suggests a transparent and modern rendering of Shakespeares language into German.